So when the new Indian Government came to power on pledges of development, their first proclamations were the world’s tallest statue, the development of the River Ganga, and high speed trains between key metros. This was followed by announcements of smart cities, road networks, new railway links, ports, a new capital city for Andhra Pradesh and hundreds of bridges and power projects across the country. Failures to galvanize the Indian infrastructure sector in the past, were smugly put at the doorstep of the last government, and with some drastic tweaking of the land acquisition process, they were ready to give India the infrastructure (and monuments!) that would be the envy of all Asia – and that too in just 5 years! To be fair, the last government had tried its best to upgrade urban infrastructure through the JNNURM with private sector involvement, so why has the infrastructure sector in India NOT lived up to expectations? A report by McKinsey entitled ‘Building India – Accelerating Infrastructure Projects’ may have the answer. It identifies several bottlenecks in the development process from the planning and design of projects, to the tendering process, to their actual execution with inadequately trained manpower. Poor quality of planning and engineering design, which creates problems such as scope changes and variations during project execution, thereby creating disputes and delays. Tendering of unviable PPP projects that are planned beyond their scope, contain dated cost estimates that lead to insufficient viability gap funding (VGF), and increased risk to the provider due to several contractual terms such as the possibility of termination of concession, if traffic crosses a threshold level. Use of inappropriate contracts that allow the designs to be variable and increase the frictional cost of interaction between the nodal agency and the construction contractor. Slow and centralised pre-tendering approval processes, involving a plethora of government agencies, with minimal or no accountability for resultant delays. Once a project finally gets going, the construction phase is marked by delays in land acquisition, ineffective resolution of disputes, shortages in the availability of skilled manpower and weak performance management in nodal agencies, resulting in time and cost over-runs. Nodal agencies are hampered by weak performance management including low transparency in performance, lack of meaningful incentives, and absence of clearly defined consequences in the event of under-performance. 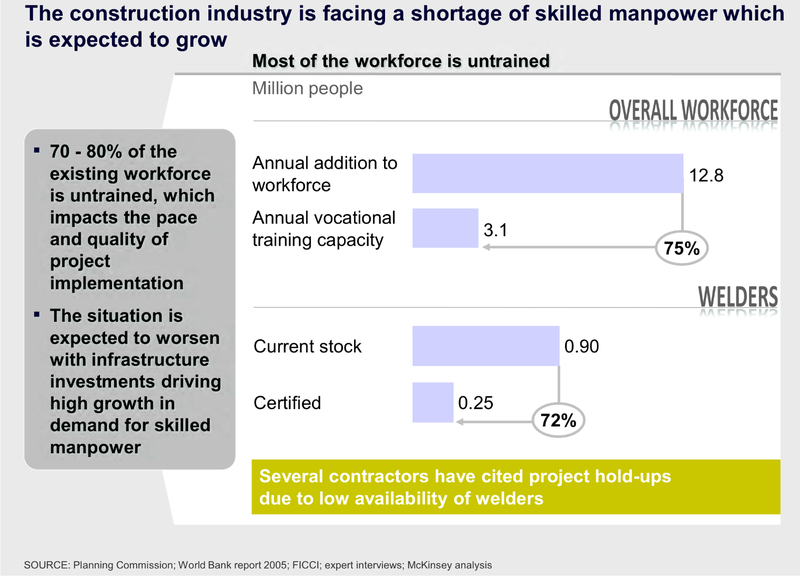 Insufficient availability of skilled and semi-skilled manpower is a major and enduring problem. A survey by the National Sample Survey Organisation estimates that while 13 million workers enter the market every year, only 3 million receive training. Furthermore, India’s vocational training curriculum is largely outdated and not based on clear standards, and the current certification process is based largely on theoretical testing, and does not ensure employability. So much for India’s demographic dividend! After winning a contract with great difficulty, the provider faces further problems. The report found that skills are weak across the value chain – ranging from the near absence of risk management skills, to below-par design and engineering skills. This paucity of skills is aggravated by a lack of best-in-class procurement practices, and low prevalence of lean construction principles. While the current Government may make some headway in addressing the land acquisition, project design, and tendering issues in the short term, the real challenge lies in building up the country’s skilled and semi-skilled manpower base. In other words, it should mature from the current project-mode of thinking to policy-mode. It took Japan, China, Singapore, South Korea and Thailand decades of social engineering to universalise primary and secondary education, and vocationalise their higher education, so that they had a trained and ready workforce in place when the industrial and infrastructure revolutions hit their shores. But the Indian Government is constrained by its 5-year electoral myopia and refuses to take a long term view of human and social development. Again, liked it. I fully agree with you Ma’am. ITIs are required than IITs, IIMs. But, where are the teachers?? The quality of teaching and education has so much deteriorated. Its only those coaching classes which are thriving and universal method of teaching is through the rote learning. Teaching can no longer be called a noble profession. Consequently, there will be dearth of skilled labour force.